Jade plants (Crassula ovata or Crassula arborescens) are succulent plants with ovate leaves of one to two inches in length and width. They are native to arid climates such as in South Africa and, like most plants, will thrive in environmental conditions that mimic their origins. It is important to keep this in mind when deciding where to grow your jade plant, especially when considering the light requirements. Jade plants can be grown outdoors in climates where nighttime temperatures stay above 40 degrees Fahrenheit (4 degrees Celsius), hardiness zones 10 through 12. In these areas they can be evergreen shrubs or used in containers as specimen plants and grow happily in partial sun and partial shade. This generally means that the plant will enjoy either dappled shade (such as under a tree) or three to six hours of sun exposure per day. Jade plants may also grow well in full sun locations but benefit from adequate air circulation to help avoid sunburn on their leaves. If you are growing your jade plant outside in a northern climate (zones 5 to 7) during the summer months, it may prefer a full sun area, as the sun is less intense in northern exposures. Indoors, light levels are generally lower than outside. This means that a jade plant will thrive in a more sunny spot in your home than it might require outside--a window with a Southern exposure with nothing blocking the light from entering is ideal. If you do not have such a window, try to find the brightest space you have in your home. A sparse and "leggy" jade plant that has little or no growth is a sign that there is not enough light. If you simply do not have enough daylight (at least six hours of bright light) you might try using artificial plant lights that are available at your local hardware store for supplemental lighting. If you plan to move your jade plant from indoors to outside in the summer, it is important to slowly introduce it to higher light conditions after being inside. This is best done by increasing its sun exposure slowly over a two-week period until it can be established in the location where will be for the rest of the summer. When bringing your plant back inside in the fall, repeat the same process in reverse, methodically giving it less light until it is back in a sunny location in your home. This will help the plant adjust to new light levels without experiencing shock. When bringing your jade and other houseplants in from outside, check them thoroughly for pests (mealy bug, aphids, spider mite, etc.) so that you do not bring any unwanted guests into your home. Many insect problems can be treated by simply wiping them away with cotton balls and rubbing alcohol, and you can check with your local garden center for other organic and people- and pet-friendly insecticides if necessary. Jade plants like to be in well-drained soils and prefer to stay fairly dry, as they can be adversely affected by over watering. 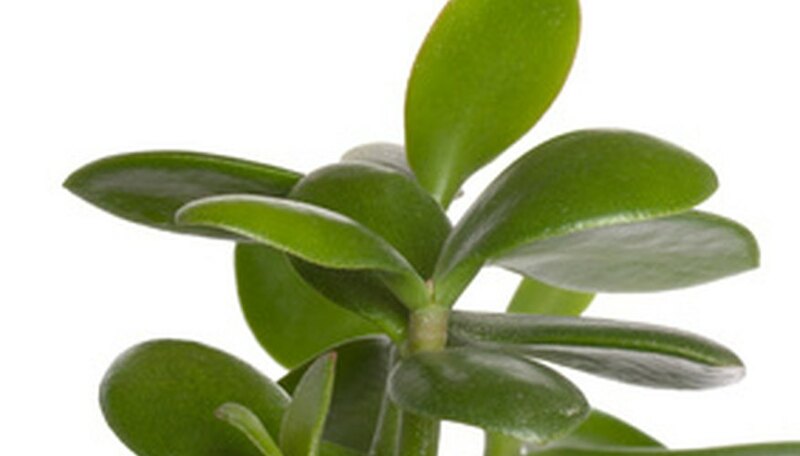 Like all succulents, jades have special structures and metabolic systems to store water in their fleshy leaves to survive dry periods that occur in their natural habitats. Take care not to over water your jade plant. Stephanie Lenhart has been writing since 2005. Specializing in horticulture, gardening and floral design, her work appears on GardenGuides.com. Lenhart holds a Bachelor of Science horticulture from Penn State University and has also attended professional lectures and courses at Longwood Gardens in Kennett Square, Pa.